I really love tomatoes. Love. So much so that in the summer, I’ll often eat them like apples with just a sprinkling of salt. But that’s in the summer. In March, the tomatoes aren’t nearly as delicious. Luckily, there are tons of other tomato-y products that are pretty tasty year-round, like sundried tomatoes, tomato paste, and tomato juice. I happened to have all of these things in my pantry, so I decided to create a sauce by combining them with a few ripe tomatoes, some basil, garlic and truffle salt. Yes. Truffle salt. If you don’t have any in your kitchen, you should. It’s an easy way to make any dish –especially pasta — that much more special. 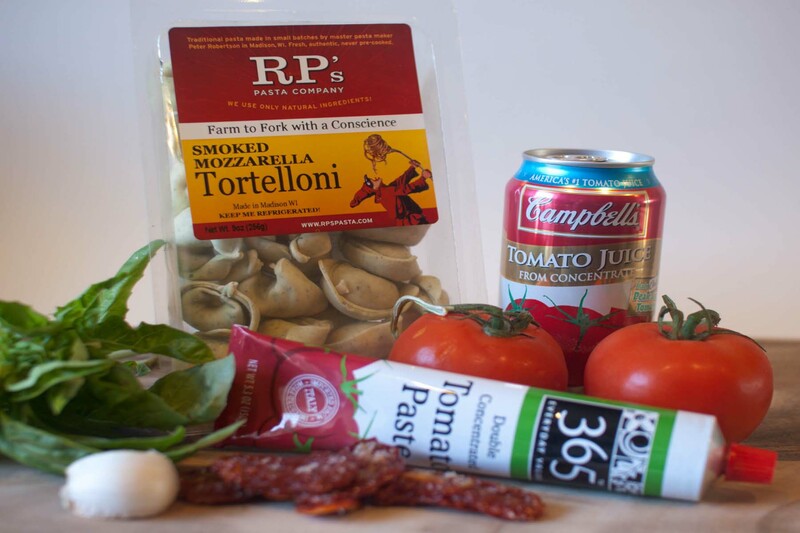 Cook tortelloni in salted boiling water for a minute or two less than the package instructions. Drain, put in a large mixing bowl and set aside. Meanwhile, put tomatoes, tomato paste, sundried tomatoes, tomato juice, basil, garlic, truffle salt and pepper (to taste) in a blender and whirl until well combined. Add sauce to the cooked tortelloni and gently toss to combine. Add mixture to a small baking dish, top with Parmesan cheese and a drizzle of olive oil. Bake for 20 minutes and broil for a minute or two or until the top becomes slightly brown. 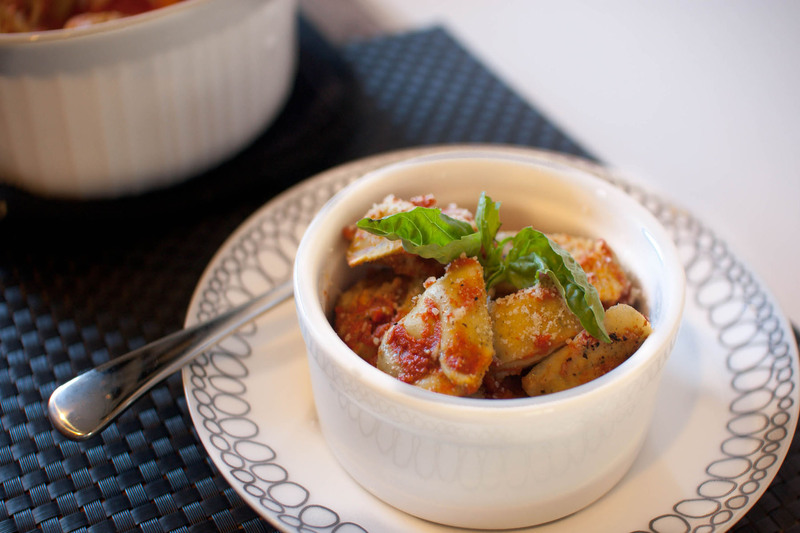 Serve topped with additional Parmesan cheese, basil and freshly cracked pepper. Looks fabulous! I’m the same way with tomatoes and can’t wait until the summer farmers market. My mom grew her own and we had fresh tomatoes growing up. Buying them in the store now just isn’t the same! I love how easy that sauce is to make, and I need to try some truffle salt that sounds amazing. Ok so we’ve been bugging your husband to bring leftovers with no results thus far, so I’m escalating this request right to the top! I mean really…all I’ve gotten so far is part of a brownie! How fair is that I ask you!?!?!? I am with you on the tomatoes..I just put them on the plate with bit of salt and that would my snack! Love this dish..sound so easy but delicious and pretty at the same time! Wonderful post!! Yum, these look really hearty! 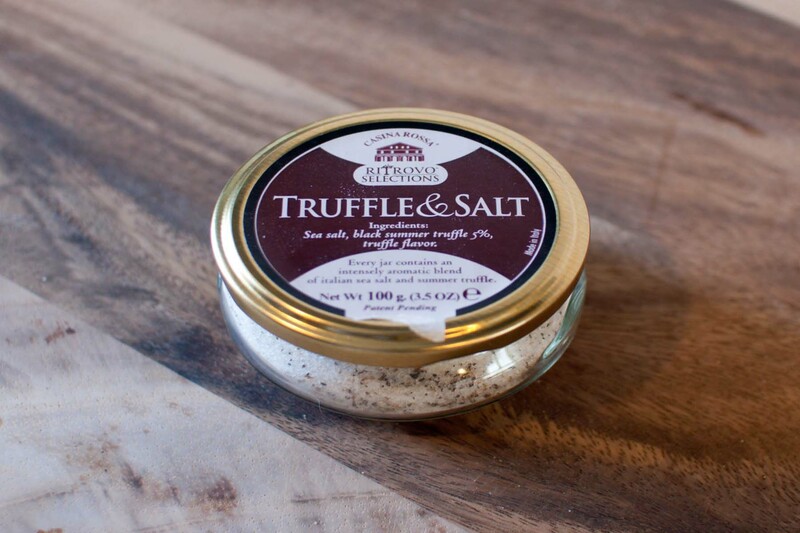 I think I may need to buy some truffle salt! I don’t love tomatoes (actually I can’t eat them unless they are cooked into something). That being said, I love tomatoes in things. This baked tortelloni looks beautiful. And I want to thank you for showing your ingredients because I never knew tomato juice could come in the small cans. That would be a great addition to my pantry. Yup! That’s the same size as a soda can — very handy to keep in the pantry. yumm!!! I’m actually not a tomato person unless they’re cooked! yes I’m weird. This looks amazing! and the tomatoes are cooked! Perfecto- and I will have to get my some truffle salt! I love all the different tomato flavorings in this dish! 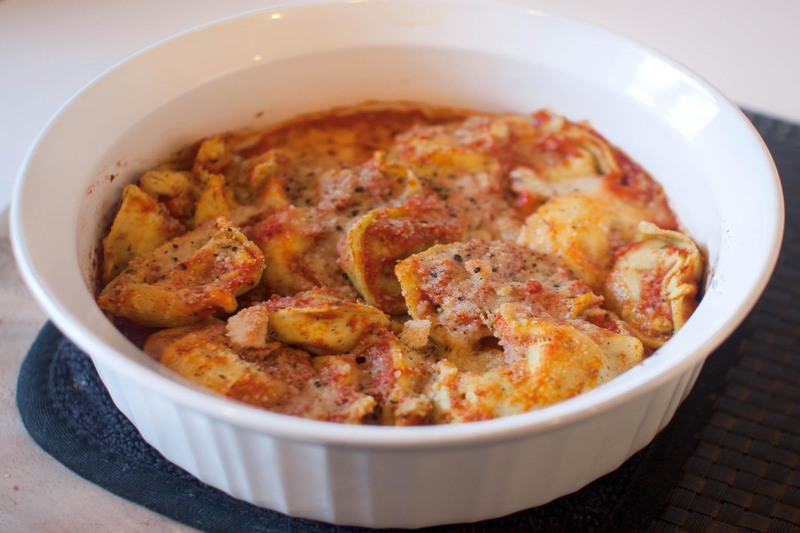 I’ve also never thought to bake tortellini before – brilliant! That looks fabulous and I really love tortelloni…really delicious! OMG. It’s like a really bad idea to look at your food blog when I’m like hungry and stuff. :-p Even more so when my kitchen is practically bare of any ingredients since we’re leaving for Cabo on Saturday! Ha! I make it sound like I’m in such dire circumstances. :-p Oh well. But yes, anything baked with cheese it awesome. I’m still hungry. Have fun in Cabo, lady! I’m very different when it comes to my feelings towards tomatoes… I don’t like the “chunky” texture in things. But love me some non-chunky marinara sauce…. yessss…. Sure — it’s Casina Rossa Truffle & Salt. I believe they sell it on Amazon, but it’s also available at specialty food stores. oooo this looks so good. I don’t know how I missed this post when it came out, but this looks unreal! Perfect for a chicago day like this, when despite the fact the calendar says the end of April the weather has reverted to November. were can u get truffle salt in toronto????? If you want the full affect of the truffles, wait until serving and add the salt and a dash of truffle oil.